Diagnosed with PBC? Learn about your clinical trial options. When Lori Jump's doctor got results back from a routine blood test, he admonished her to watch her drinking. "But I don't drink," she told him. A few weeks later, at an appointment with a gastroenterologist, Lori was diagnosed with primary biliary cholangitis, or PBC, a chronic liver disease. PBC is a rare autoimmune disease in which the body's bile ducts are gradually destroyed. Unlike some liver diseases, PBC is not associated with heavy drinking; in fact, doctors aren't sure what the underlying cause of PBC is. PBC typically doesn't show symptoms in its early stages, so like Lori, most people are surprised by the diagnosis. In fact, it was another eight years before Lori started experiencing symptoms. While patients may not feel symptoms at first, the disease still progresses. When she was first diagnosed, there was only one existing treatment for PBC: Ursodeoxycholic acid (URSO). Also known as ursodiol, this treatments helps move bile through the liver. While it doesn't cure PBC, it appears to improve liver function and liver scarring. Unfortunately, 25 to 40% of patients don't respond to URSO alone. That made the search for more treatment options even more important for PBC patients. At the encouragement of PBC specialists in nearby Seattle, Lori decided to join a clinical trial for an investigative PBC treatment. While she appreciated that the trial would cover gas money and parking – a plus in pricey Seattle – the opportunity to help others living with PBC was most important to her. "I thought if I can help out, if I can find something that can help, then I should," she said. Plus, participating included benefits for her personal PBC treatment, too. "I could also see a lot of specialists at one time, without a lot of hassle." Before joining, she read up on the results from the Phase I trial of the investigational treatment – a step she suggests taking if you're considering joining a trial. She joined a Phase II trial of that same potential treatment and started attending site visits every few months. Every time she went in, she met with doctors and nurses and had an EKG and blood work done. "Having top-notch doctors, I felt confident that they were watching me closely," she said. The trial aimed to improve levels in the blood. It was a double-blind trial, so neither she nor the researchers knew whether she received the investigational treatment. She found out at the end of trial that she was taking the active treatment, which was approved to move on to the final testing stage, Phase III. She wasn't sure if the treatment was affecting her – she hadn't begun to experience the main symptoms of PBC yet – but after the Phase II trial, the researchers let her know that it was helping improve liver test results for the patients taking part overall. One benefit of participating was that she received free medication and doctor's visits, she said, so she decided to see the treatment through and participate in the final phase, as well. After reviewing the results of all of the trials, the FDA approved the treatment. In all, Lori participated in the trial process for several years, and she's proud to have been a part of getting a new option to patients. Today, she regularly checks new trial options and considers taking part in another to continue moving PBC research forward. 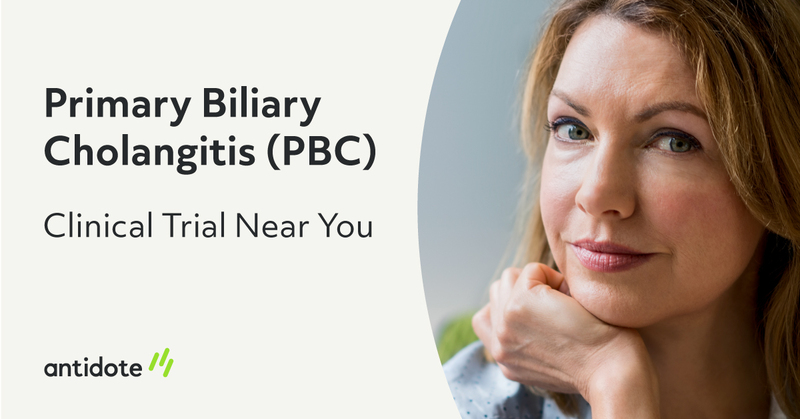 There is currently no cure for PBC, and no treatments approved specifically for some of the most challenging symptoms: itching and fatigue. For those recently diagnosed with PBC, Lori encourages patients to seek out expert opinions at teaching hospitals or research centers if you can, whether or not you participate in a trial. "When I was diagnosed, I was 36 and getting married soon. I wanted kids, and I was told I shouldn't have them because I would only live five more years," she said. "Twenty years later, I have an amazing 17 year old daughter. I think it's important for patients to get a second opinion." For PBC patients, she also recommends checking out the support group at PBCers.org. She discovered this group the first month she was diagnosed and received a lot of local and worldwide support. If PBC patients choose to participate in a clinical trial, Lori encourages them to bring that same inquisitive attitude to study visits, too. "Ask a lot of questions and expect answers," she said. "Expect to be treated as someone who's part of the solution."